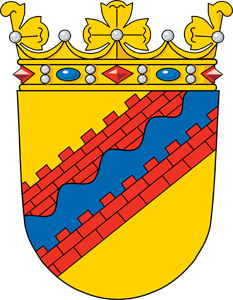 Coat of arms of Ingria is the national coat of arms of Ingrian finns. The first mention of the Coat of Arms of Ingria was in the Swedish Laurentius Petri's chronicle in 1581. In times of King Charles XII of Sweden the coat of arms got yellow-red-blue color scheme and crowned with a royal crown. In 1730, in times of Russian General-Governor Christoph von Münnich the coat of arms has been strongly changed. In 1919 captain Eero Ilmari Haapakoski restored the coat of arms of Ingermanland back to historical yellow, red and blue colors. The modern version of coat of arms created by the famous Finnish heraldist Kari K. Laurla in 1989. The yellow background represent the fertile fields of Ingria, the red color – the castle walls and the blue color – Ingermanland rivers.